The last couple weekends have been filled with family time - Andrew and I spent last weekend at the Cape with some of my family, and we were at my cousin's wedding last night in Boston. My family is a lot of fun, so I'm always happy to have the chance to spend time with them. Getting to eat homemade Indian food makes it all the better. Family recipes are one of my favorite sources for blog inspiration. I love trying new recipes in general, but it's extra special to learn how to make a family favorite. When we were at the Cape, my mom made a batch of her tomato chutney one day. After snacking on it all afternoon, I decided that I needed to learn how to make it, and that I had to do it while tomatoes were still in season. My parents were staying at our apartment this past weekend because of the wedding, so I had the chance to go to the farmers' market with my mom and pick out some gorgeous tomatoes for this dish. She taught me how to make it, and the batch she made disappeared pretty fast! Good thing I know how to make it myself now so I can whip it up whenever I want. This chutney is absolutely addictive with bread, crackers, and cheese, and as my mom says, a glass of wine makes it even better! Asafoetida powder can be found at Indian grocery stores. You can omit it if you can't find it. If yours smells very strong, use 1/4 tsp, otherwise use 1/2 tsp. This chutney is spicy, but the heat is part of what gives it character. You can reduce the chile powder a bit if you want but don't omit entirely. Serve this chutney with bread or crackers. It also goes very well with cheese, particularly feta, goat cheese, or brie. Heat 3 tbs olive oil in a large pan over high heat. When oil is hot, add mustard seeds. When seeds begin to pop, add chopped onions and reduce heat to medium. Add turmeric, asafoetida, and 1/4 tsp salt. Cook onions until very soft, about 7-8 minutes. Add tomatoes, chile powder, and 1 tsp salt. Cook until tomato water has evaporated and chutney is very thick, about 25 minutes, stirring often. Remove pan from heat and stir in 1 tsp olive oil. Taste chutney and add more salt if necessary. Serve with bread, crackers, and cheese. Looks delicious - and a great way to use up some tomatoes! I love family recipes. I bet this is really good with cheese. Sounds lovely! I am intrigued by asafoetida powder and bet my spice-loving husband would like it as wel. 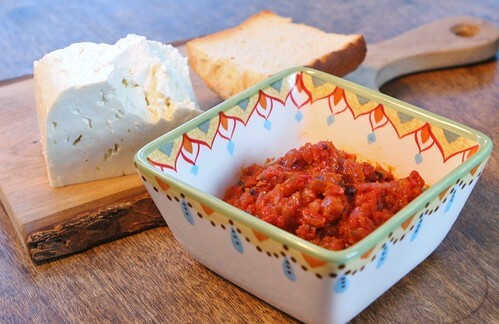 I love eating chutneys with goat cheese...this looks delicious!